Baker, insurance agent, 'snake oil salesman', etc. George Chaffin was born in 1825 and baptised in Yeovil on 27 April 1825. He was the son of baker George Chaffin (b1807) and Ann née Cox (b1807). In the 1841 census George Snr, Ann and George's younger brother John Cox Chaffin were listed living in Kingston but George Jnr was absent on the night of the census. The 1846 Tithe Apportionment noted that George Chaffin Snr was the occupier of the Duke of York in Kingston. George was not the landlord since that was William Fudge throughout this period, although it may be that George's bakery was on the premises. 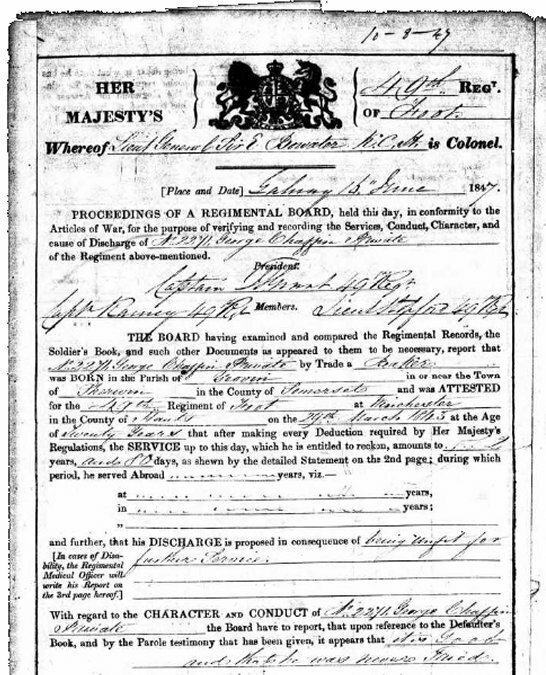 On 29 March 1843 at Winchester, Hampshire, George Jnr enlisted as a Private in the 49th (Princess Charlotte of Wales's) (Hertfordshire) Regiment of Foot. His Service Number was 2274. On 16 June 1847, after serving 4 years 2 months and 18 days home service, he was discharged as "being unfit for further service". Referring to his conduct, his discharge papers stated "it is Good and that he was never Tried". He was discharged still with the rank of Private. In the spring of 1849 George Jnr married Louisa Maria Hayward at St John's church. Louisa was the daughter of Accountant and Overseer Thomas Hayward of Yeovil and his wife Catherine. It appears that it must have been a double wedding since George's brother John married Louisa's sister Catherine Parker, formerly Hayward, at the same time. In 1850 George's occupation was recorded as a baker of South Street. George Jnr and Louisa were to have a son, George Thomas (b1849). In the 1851 census George and Louisa, together with their son George Thomas and George's mother Ann, were listed as a household living in Hendford (between the Chough's Tap and Stuckey's Bank on the corner of Custard's Lane - today's Westminster Street). At the same house, but listed as a separate household, was Louisa's widowed father together with John and Catherine and their children. 26-year old George gave his occupation as "Baker out of Employ". In February 1852 "George Chaffin the younger" was described as a "pauper lunatic" and was sent to the County Lunatic Asylum in Wells where he remained for several months. At the time he was resident in Taunton but, since his 'place of legal settlement' was Yeovil, the Poor Law Guardians of Yeovil were saddled with George's expenses. On 7 April 1857 George was initiated into the Yeovil Freemasonry Lodge of Brotherly Love, at which time he gave his occupation as an accountant. George held various offices in the Lodge and saw his younger brother John initiated in 1864. George resigned from the Lodge in 1866. It may be that he was asked to resign, since he continually used masonic symbols in his frequent newspaper advertising during this period. In the 1861 census George and Louisa, together with 11-year old George Thomas were living in Hendford, in one of the premises opposite the Three Choughs Hotel - presumably the same property as they were recorded at in the previous census. At this time 36-year old George gave his occupation as 'Clerk for General Merchant'. In 1863 he set up an auction mart for cattle on the premises of John Newman Berkley. By 1864 George was living in newly-built South Western Terrace. Probably starting as a sideline it appears that George became something of, as the Americans would say, a 'snake oil' salesman during this period. 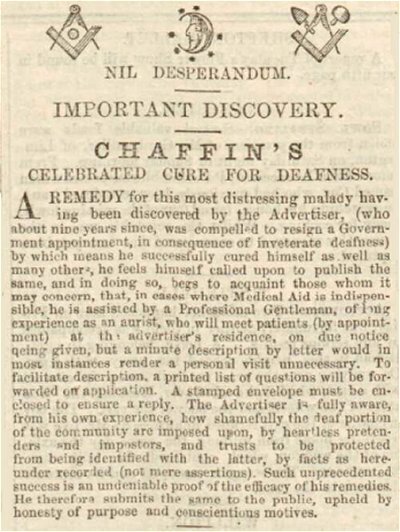 During the mid-1860s he continuously advertised his 'Celebrated Cure for Deafness' in the Western Gazette, extolling it as 'the Great Discovery of the Age' (see Gallery). This was followed by a plethora of declarations confirming the effectiveness of his remedy for deafness, witnessed by such local notables as Mayors of Yeovil William Bide, and Edward Raymond, local bandmaster of the Yeovil Volunteer Band, Alfred Beare and grocer Silas Griffin. There are various references to "Sergeant Major Chaffin" in these declarations and while Charles did serve in the army, as seen above he was discharged still a Private and therefore his assumed rank and title of Sergeant Major was not just a slight exaggeration but a complete deceit. Following the long list of laudatory declarations was another advertisement describing the many benefits of 'Chaffin's Medicated Powders' to be "used as snuff" in order to "afford instantaneous relief to sufferers from sick-headache, clear the head, and improve the sight". In 1865 he produced a booklet grandiosely entitled "A Pathological Treatise on the Anatomy of the Human Ear, explaining the various kinds of Deafness, with prescriptions and full directions for self-treatment". The booklet detailed the parts of the ear and went on to explain how such things as "a cold, nervous debility, female confinements, the mercurial treatment of venereal disease, and other causes, can produce temporary or long-term deafness". Included were his various remedies including gargles, lotions, etc. but most importantly was the extolling of "Chaffin's No 1, 2 or 3 Packets and Medicines, available at 2s 9d each, and Chaffin's Ottorhea Tincture." In the 1881 census George was listed as a patient, described as a 'lunatic', at the Somerset & Bath Lunatic Asylum in Wells. He was described as 55 years old, married and a baker by trade. George Chaffin died in Wells, presumably while still at the asylum, in the winter of 1890. He was 64 years old. George Chaffin's army discharge papers, giving his trade as a baker and his final army rank as a Private - despite his later claims. George's advertisement placed in the 20 August 1864 edition of the Western Gazette. This was followed by a plethora of declarations confirming the effectiveness of his remedy for deafness, witnessed by such local notables as William Bide, the Mayor of Yeovil, and local bandmaster of the Yeovil Volunteer Band, Alfred Beare. 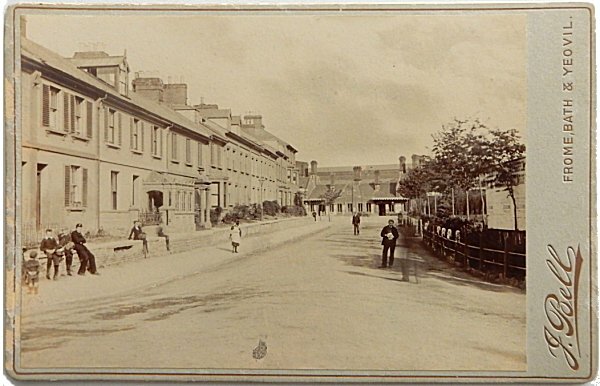 Station Road and Yeovil Town Station photographed in 1896 by John Bell. The terrace of buildings at left, still there today, is South Western Terrace built by Levi Ridout. This was the home of George Chaffin in the 1860s when the terrace was newly-built. An advertisement placed in the 12 May 1865 edition of the Western Gazette, following the publication of his 'treatise'.